The westerly airflow continues with it's low pressure and seemingly endless frontal systems. 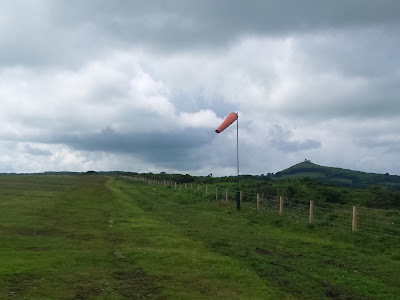 Today's forecast was not very promising but at least it was flyable with a north westerly wind around 12 to 15 knots and eight eighths cloud cover at about 1500 feet above the airfield. Today's visitors were Antoni Weeks, Angus Morris and Heather Babek all of whom flew with IFP Mike Jardine in K13 G-DDMX. A good time was had by all. 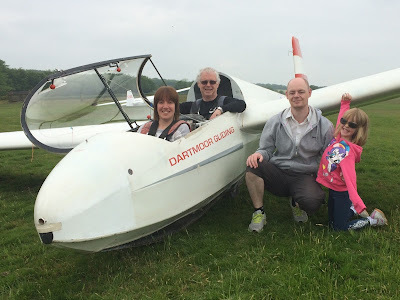 Worth a mention today was the patience of the club trainee pilots who shared the one K13 with the visitors. 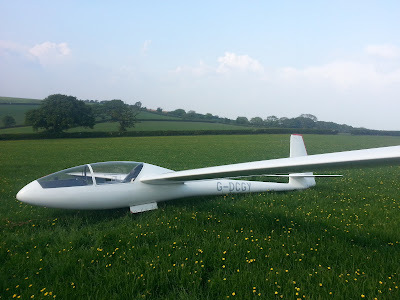 Normally we fly two K13's, one for club flying and the other for visitors but K13 G-CHXP is off line at the moment undergoing it's annual inspections. 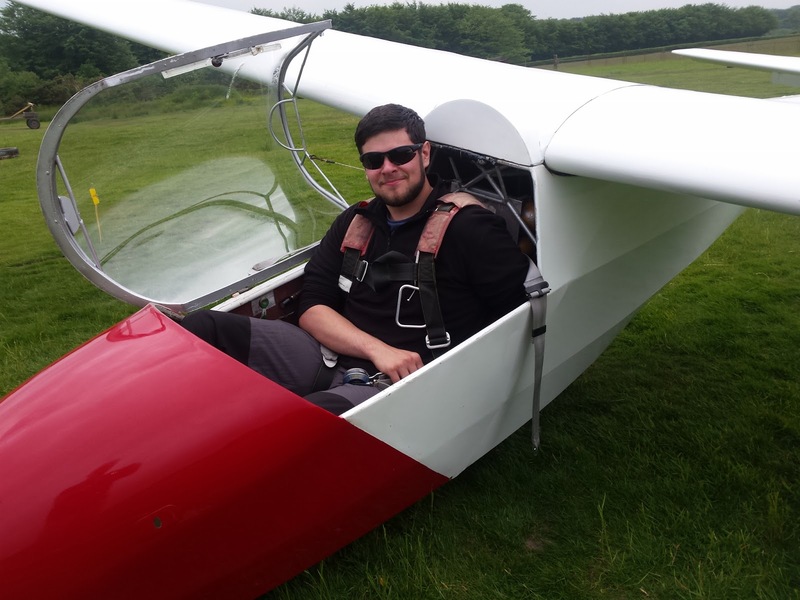 It was particularly nice to see club member Joe Nobbs re-soloing after several years of not flying. After the flying was over, the Committee members, several of whom had been flying today, retired to the clubhouse for the monthly meeting which continued into the evening. Please tell me the weather will improve soon....... anyone??? It was quiet at the airfield. 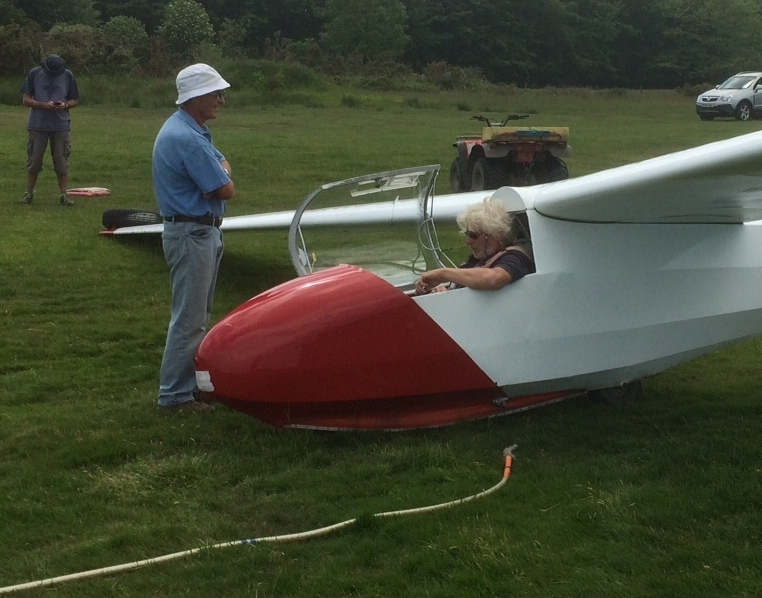 In fact the maintenance crew was the same size as the flying crew?? It rained throughout the morning. Our planned One Day Course candidate had the first ever pre-ODC ground safety operations computer aided briefing by Instructor Gordon, and will return when the weather improves. 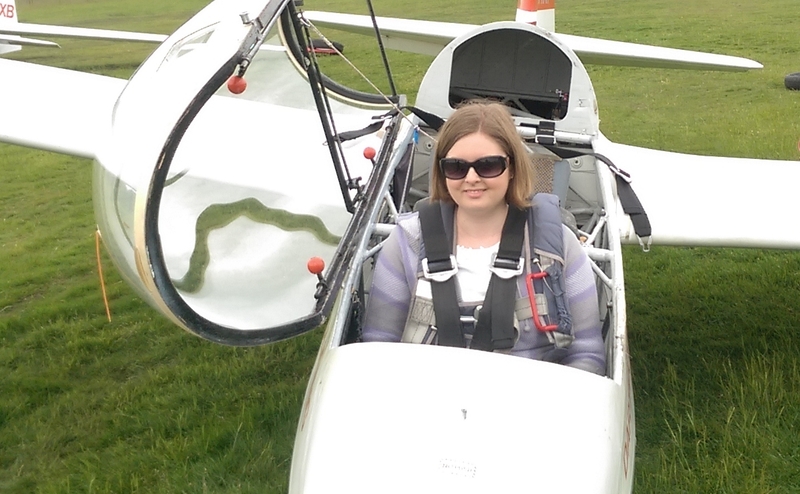 The clouds eventually lifted so the kit was got out for check & instruction flights. 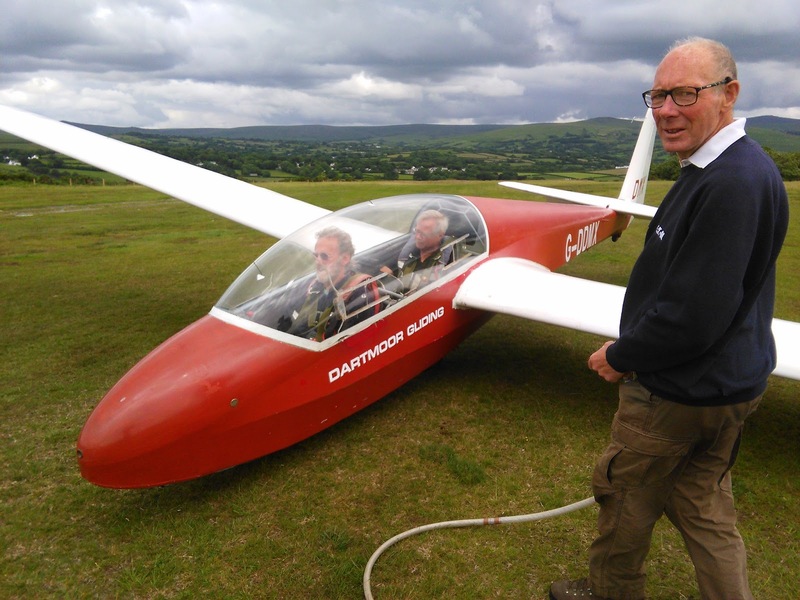 It was nice to see that Bob Sansom had managed to get to the airfield to get himself airborne after months of lending his K8 to the Club. With the Longest Day a compete washout, there was nothing else for it but to convene a Midsomer Murdering of the To Do List! The Longest Day? 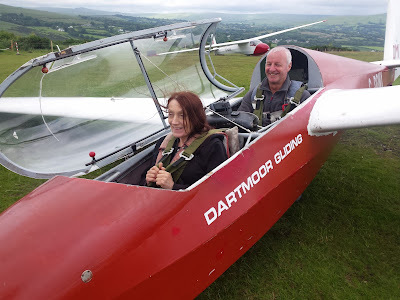 The Longest Cloud – more like..! Today was a washout from start to finish. So, whilst Martin Cropper gave our One Day Course candidate (who had travelled from Wells) Peter Spencer a teach-in on what might have been, Rick Wiles set about the 'new' quad bike with a grinder, son Matt Wiles managed to squeeze himself into the small Zetor (there must have been a bump in the roof) to (almost) complete mowing the airfield grass, and Roger Appleboom, Pete and Paula Howarth undertook the quite complicated task of manufacturing a new support bracket for the launchpoint steps prior to them being repositioned (see photos). 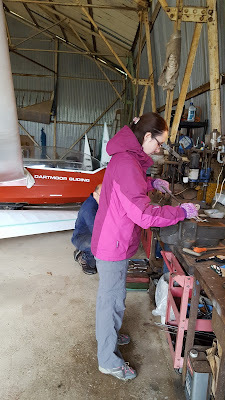 Paula Howarth at work on the new bracket for the launchpoint steps. remove the old bracket from the launchpoint steps. 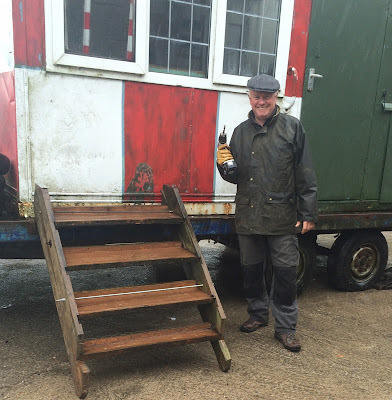 Roger Appleboom looks very pleased with the repositioned launchpoint steps. This took us up to a relatively late lunchtime (2pm), following which we decided to draw stumps and spend more time with our families. 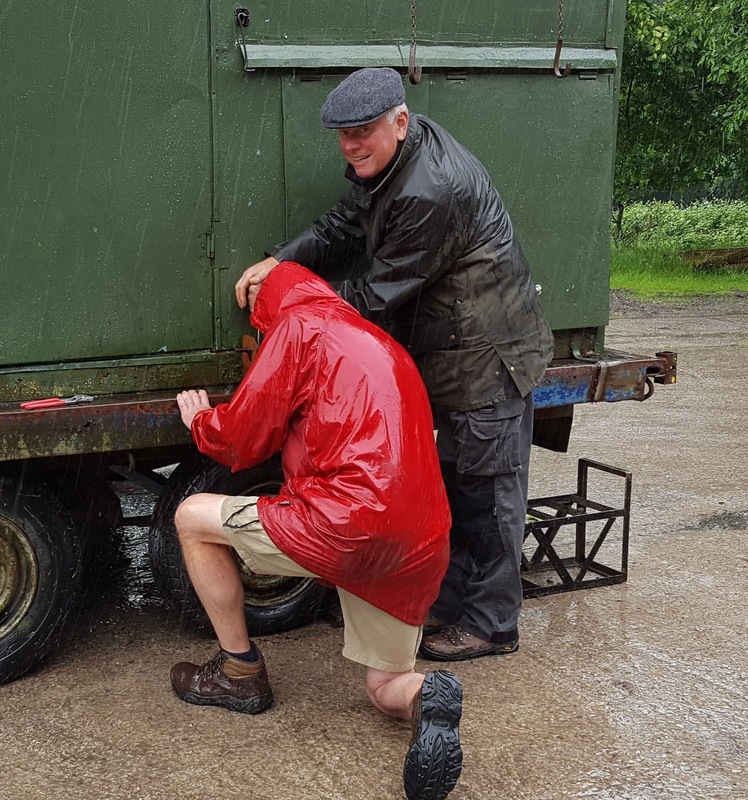 Thanks go to everyone who pledged their support for the Longest Day and to those who took heed of the weather forecast and did not commit themselves to long, fruitless, journeys. The better news is that the weather is looking good for next weekend. 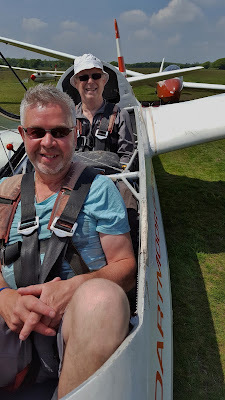 Saturday held promise in the weather forecast (well compared to Sunday) Extra room this week as we were flying from the east end of the airfield. We had wind of NW with 15knots giving 1300-1400ft launches. 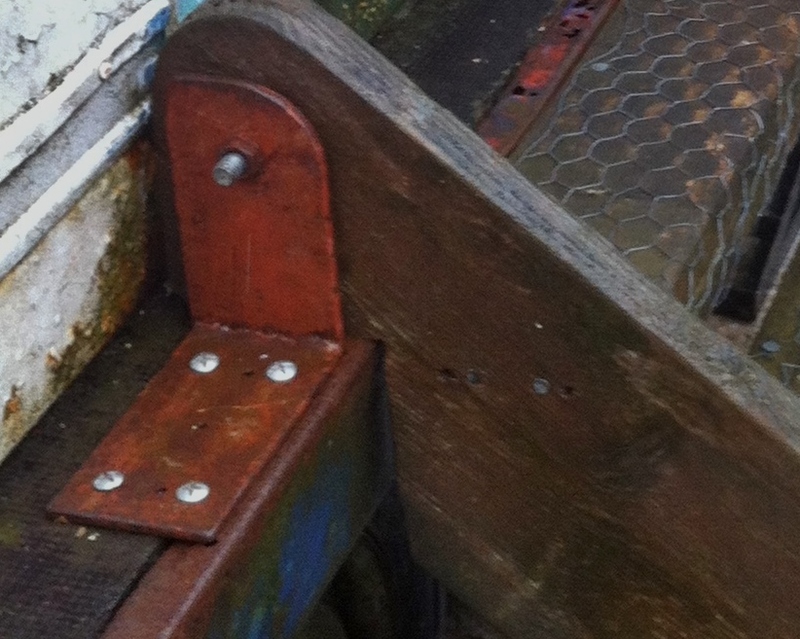 Not bad with the winch placed at the hurdle fence! 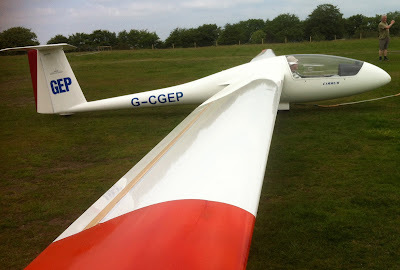 (6 flights each) and club training with a few check flights to get through, oh plus the solo list. All with one club k13 and one k8. The team was full of optimism, the end result was 44 launches and everyone flew. The one day courses today were Claire Hughes and Neil Heavens, Claire had a few initial reservations about the launch but judging by her smile on landing it wasn't all bad. 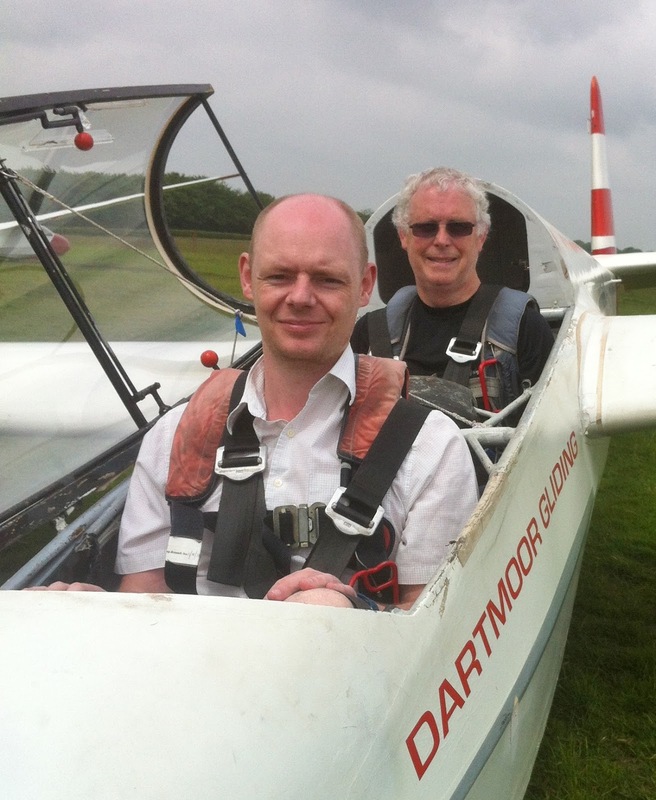 Rick then continued the training with Neil ,all round good results at a respectable pace. 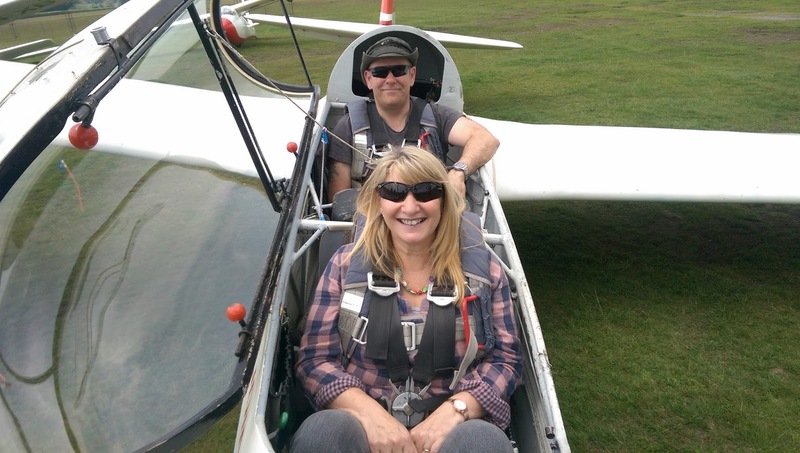 We hope to see Claire and Neil again soon. Not only did we have new faces today at the club, but also a new glider was seen flying, Chris Owen and Pete Harvey got the chance (after a long wait) to fly the beautiful 15m Std Cirrus at Dartmoor. Simon collier also continued to get experience in circuit practice in the open cirrus, all valuable stuff. 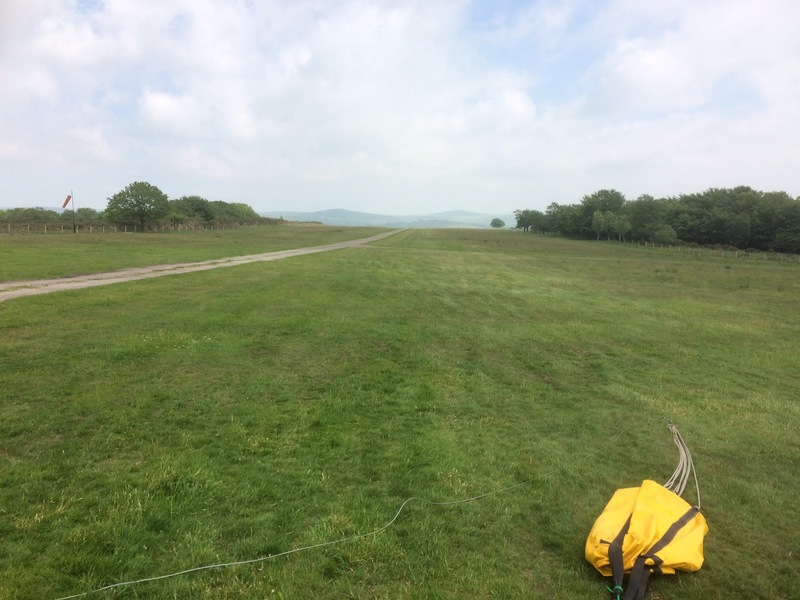 Thanks to everyone for keeping the launches going with an organised retrieve and good winching / fast "cable clear" instructions we achieved 7-8 launches an hour at times. Everyone did a stint in each roll as asked or required and I think the results say it all. 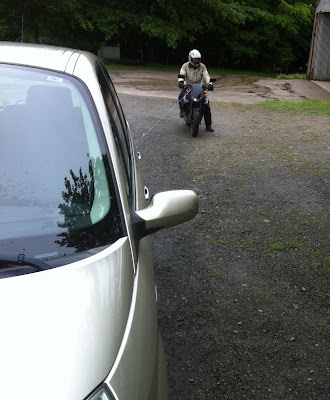 The drama started before we even got the the club, however, with the drive belt on Roger Appleboom's powerful American (but not Harley-Davidson) motorbike breaking a quarter of a mile short of his destination. 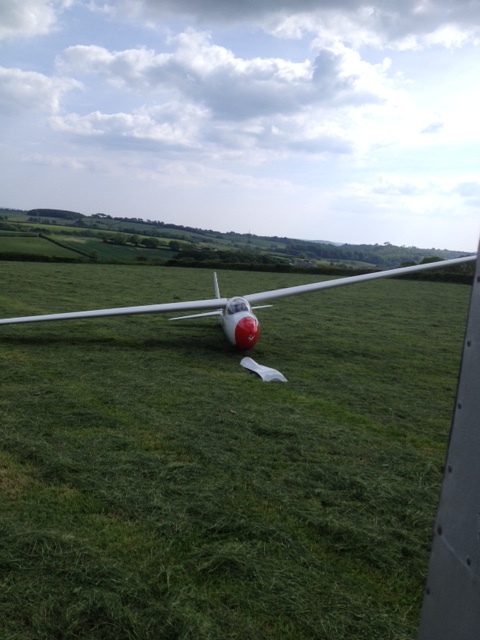 He eventually arrived by tow courtesy of Dave Downton (see photo). A novel way to get to work! In view of the poor weather forecast the Task of the Day had already been set by Rick Wiles via email: 'Grasscutting'. 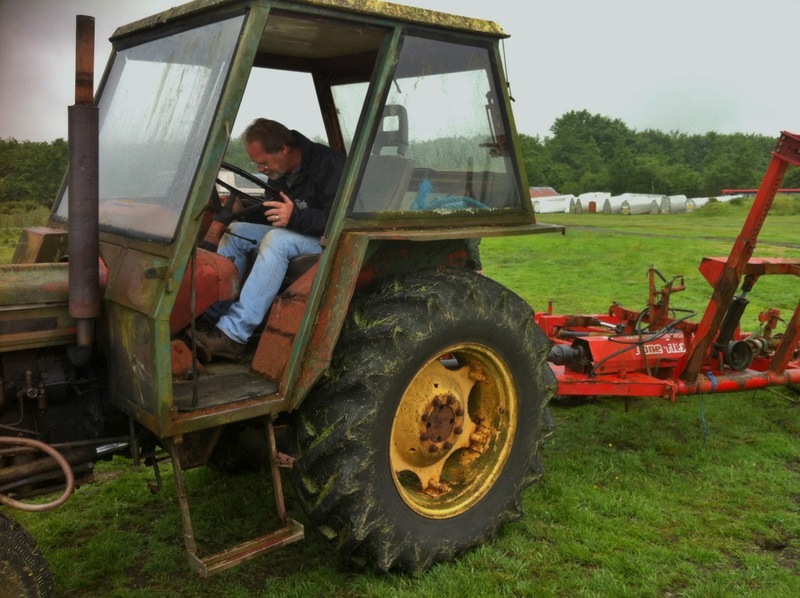 “I've set up the PTO on the small Zetor but the battery is weak (ie. doesn't work) so all you need to do is jump start it and use a screwdriver to short across the starter motor terminals...” (also doesn't work). 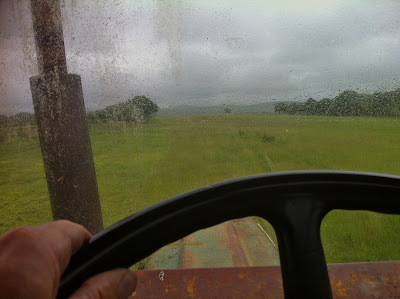 Eventually, by cleaning the terminals we got the tractor going and from then on it was full steam (ie. less than walking pace) ahead with redressing the recent miraculous rate of growth of the grass. Except he doesn’t, and he can’t – but 5 minutes later, he was! Pete Harvey figures out how to get the small Zetor started. 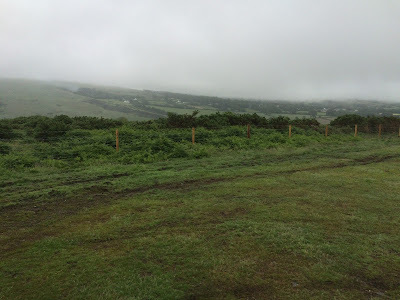 View from the office looking east via the raindrops to Dartmoor. Whilst this was going on (involving a team of tractor drivers) other miracles were succeeding disasters in the hangar. Having decided to tackle a small amount of delamination on the trailing edge of one of K-13 DMX's wings, the scales positively cascaded from Colin Boyd's eyes as he discovered first one, then two three and four further problems with the wing. By gathering a team around him, however, (Pete Harvey on glue, Leith Whittington carpentry, Rich Roberts on straps and Dave Downton dope) and establishing a real time hotline with Regional Technical Officer John Halford, Colin was able to deal with all these defects simultaneously, leaving just some 'closing up' work to be done between now and the Longest Day. 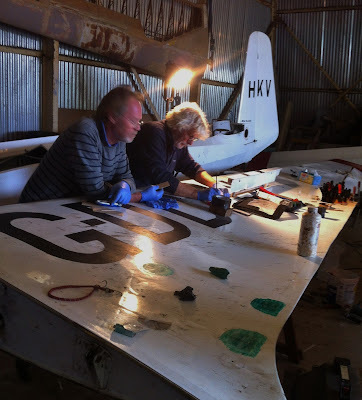 Pete Harvey and Colin Boyd at work on the airbrake box of K-13 DMX. 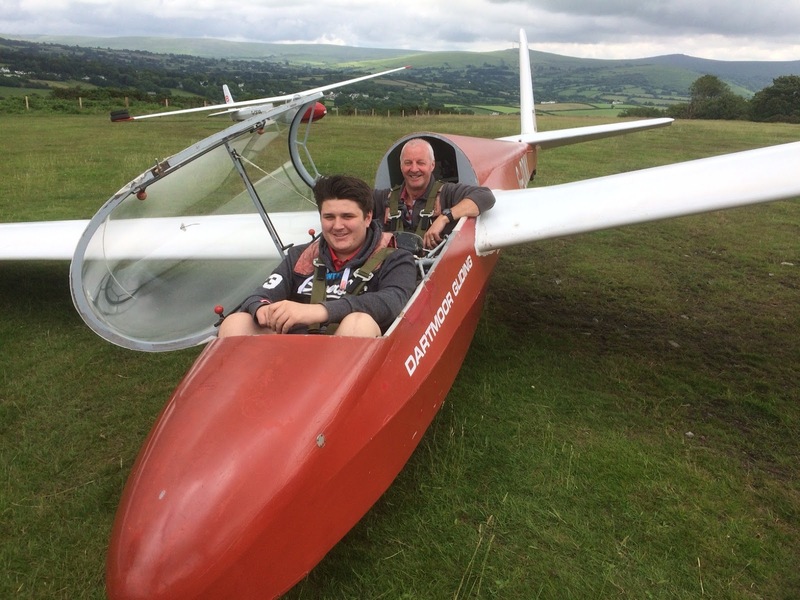 How do you get a glider pilot to burn his ear? 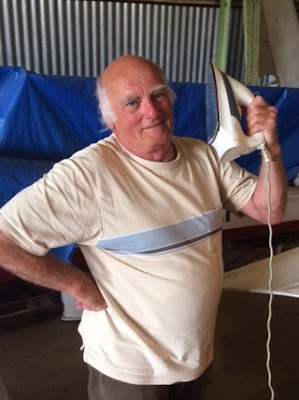 Ring him up whilst he’s doing the ironing, of course! Dave Downton shows how it’s done! Our final task, in consequence of Heather Horswill having spent an inordinate amount of time on Friday clearing cow pats from the hangar hardstanding, clubhouse and launchpoint areas, was to weave a length of cable in and out of the hurdle fence panels, thus preventing the fence from being opened by cows – each end of the cable being secured by a combination padlock (the usual code). Thus although we didn't fly, which was understandably disappointing for some, we did get a lot of urgent, Longest Day threatening, tasks either achieved or almost completed. 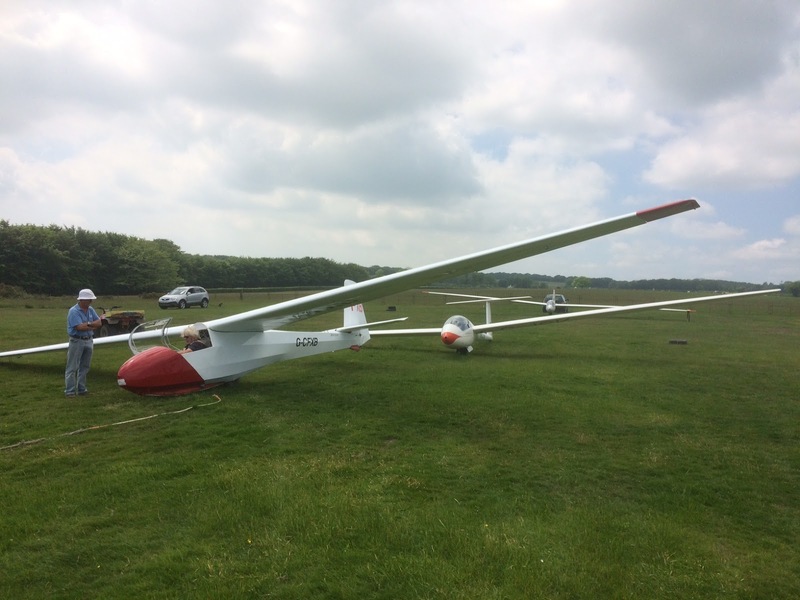 After a weeks good weather, hopes were high for the flying at the weekend. This, obviously, was not to be the case. Friday saw no flying whatsoever, It rained from 8:30am when the hangar doors were opened, until 5:30pm by which time all hope of flying had been lost. 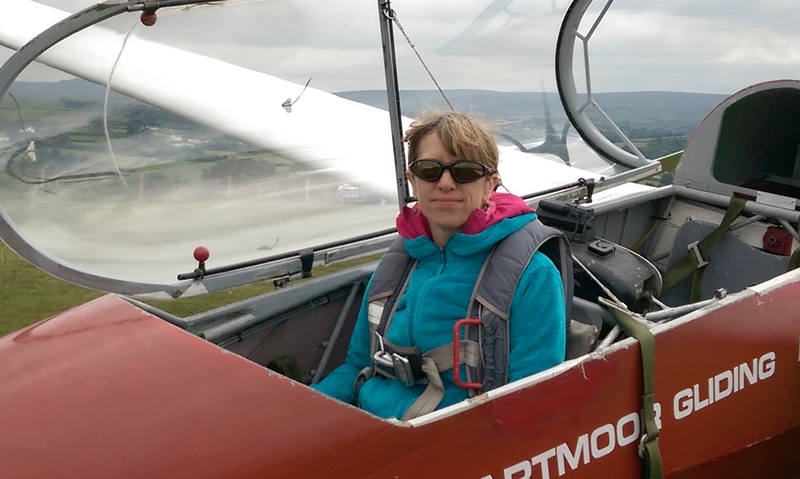 Saturday saw started with a low(ish) cloudbase with a light SE breeze. 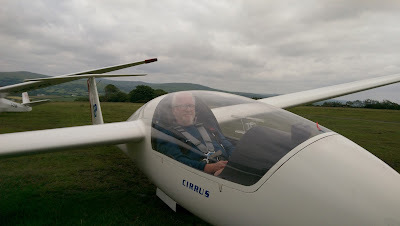 As the day wore on, the cloudbase lowered continuously ending with an absolute downpour at 4pm; heavy enough to get soaked to the skin in about 3 minutes flat. At this point flying was terminated. 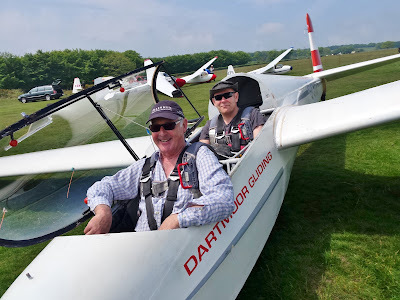 We welcomed 3 visitors today, Joshua Cutler, and father and son duo Barry and Scot Nichols, all of whom received their Introductory Flights from Mike Jardine who even managed a couple of short soaring flights. The jury is out on what his source of lift was. Adrenaline would be my guess. Club Flying was limited to some AB-initio training and some backseat practice in the K13. What a delight! A light easterly that (almost inevitably, given our proximity to the south coast) became a southerly as the day went on. Moderate to good conditions for the solo pilots (hours of soaring under soft ballooons of lift) and benign enough for trainees to undergo launch failure training without incurring too much, if any, delay to the day's launch rate. 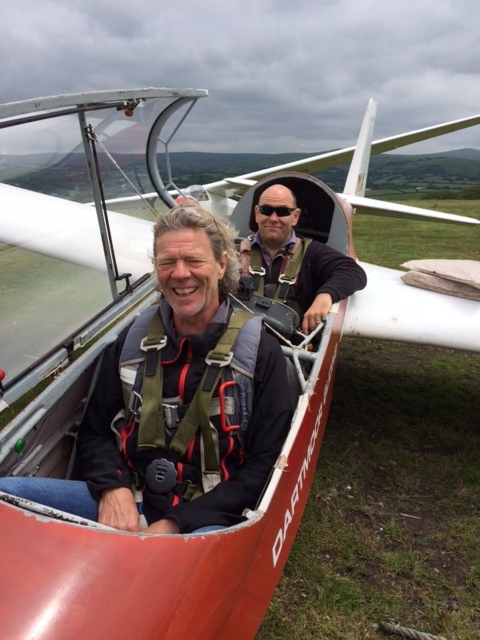 Mount Kelly College’s Headmaster Mark Semmence flew with Pete Howarth. 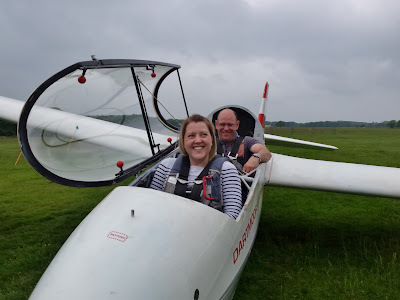 We flew five introductory visitors today (most of whom had bought Two Flight Vouchers) – most notably the new Headmaster of Mount Kelly College Mark Semmence, plus Angela Payne, Roger Doyle, Steve Green and Anita Payne (no relation). Both Angela Payne, from Roborough, and her partner Terry Doyle, flew with us today. Visitor Roger Doyle was our second IFP of the day. 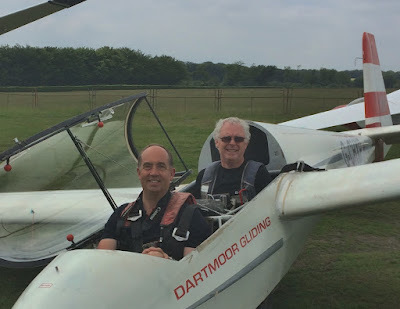 Steve Green flew with IFP Pete Howarth. Pete Harvey taking up slack in his new to site Standard Cirrus. (ie. away from the airfield) leg of his flight. 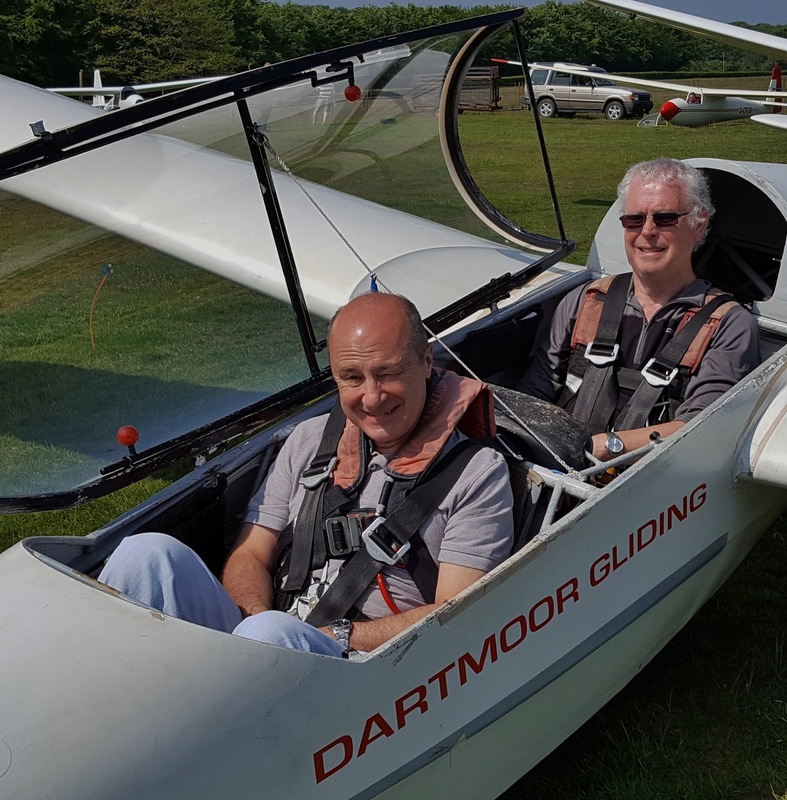 Others enjoying the conditions included Leith Whittington (Dart 17R), Barry Green,Paula Howarth and Allan Holland in the club K-8. Among the trainees, Dave Downton ticked some big 'cable break' boxes whilst Ed Borlase refined his speed keeping skills and Jeff Cragg revisited his thermalling technique (the one that goes from positioning yourself underneath Allan Holland and takes you from 950-900ft). First thing in the morning the sky was clear and blue promising a good day to come. 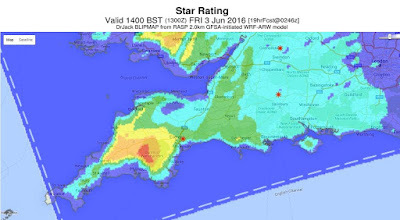 By 10am, however, the blue had been obscured by a lowish flat grey cloud sheet. A training day? 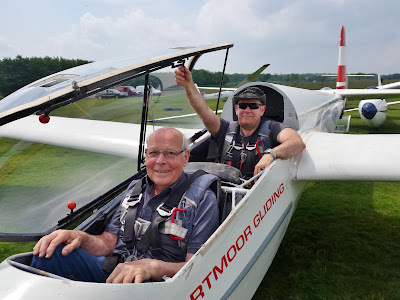 Today's instructor in charge was Mike Sloggett once again. Mike is always a welcome visitor. His father was one of the original club members and Mike's own history with the club goes back a very long way. 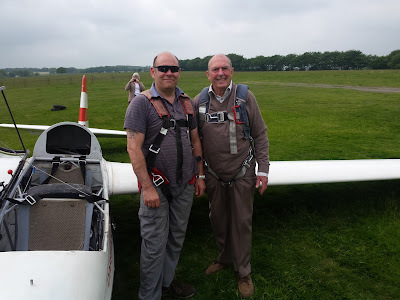 Mike was assisted today by Rick Wiles who was tasked with flying with today's visitors. We had four visitors today, Louisa Pearson, Simon Romaine, Jo Batchelor and Tony Sullivan who all left the airfield with smiles on their faces. 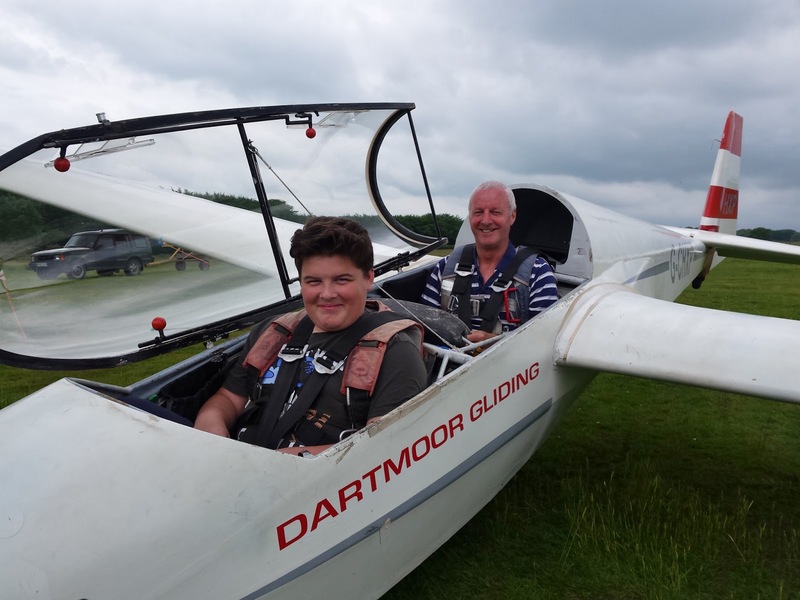 It was nice to see the return of young Ben Caverhill who flew with us on a One Day Course and began his flight training today. By the end of the day Ben had filled in several entries on his Training Card. When not flying Ben was keen to help and, after training, spent quite a bit of time towing the aircraft around with the quad bike. 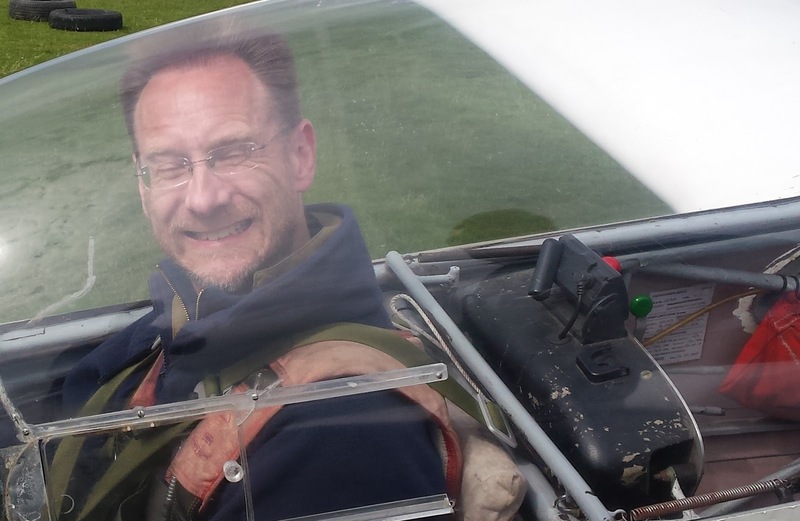 There was a great deal of effort from the solo pilots to find some rising air to soar on but it was not until the last flight of the day when Dene "Scratch" Hitchin, practicing from the back seat of the K13, managed to find a solitary thermal to extend his flight to a day winning 11 minutes. The other flight of interest today was by Matt Wiles who converted ( re-converted?) to the K8. Matt Wiles ready to fly the K8. 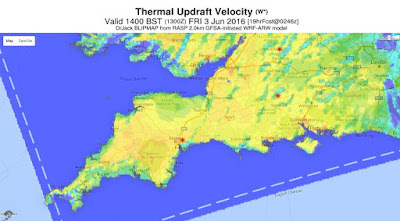 RASP for 2pm suggesting Thermal Updraft of 400 feet per minute. 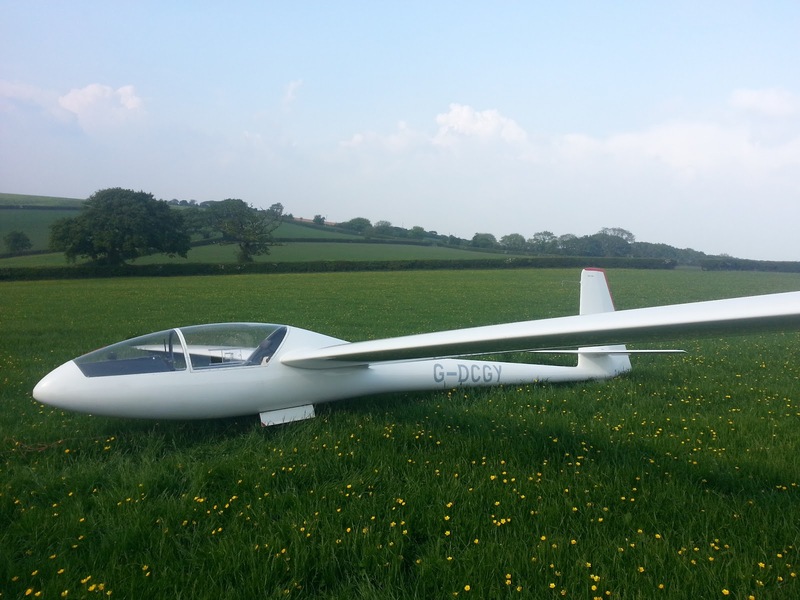 ( the sink rate of the sailplane has to be deducted ). So thermals about 2knots or so. A warm sunny day and a good RASP forecast brought out several members today even though this was designated as a no training day. The grid consistent of the club K8 and Mike Jardine's Astir CS and Mike Gadd's Open Cirrus. Colin Boyd ready for the off in the K8. Today's grid. 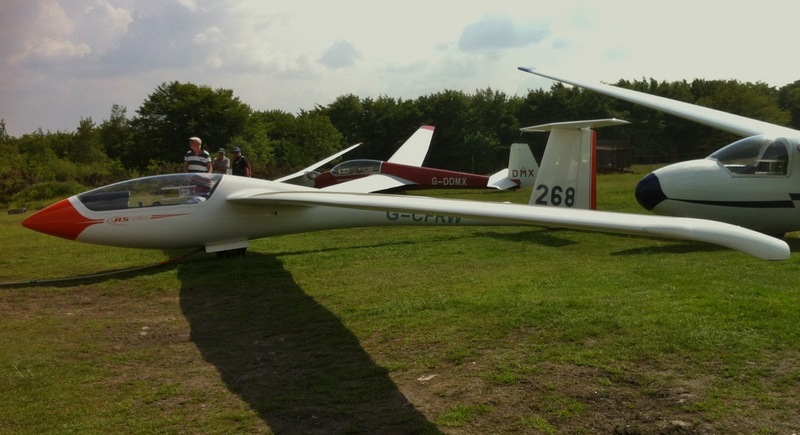 K8, Astir and Open Cirrus bringing up the rear. Unfortunately, the soaring did not live up to the 3 Star rating given by RASP. 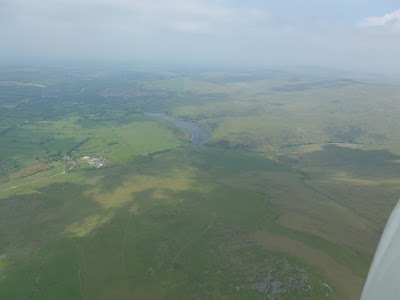 The average flight time was around 20 minutes with most of the attending members managing some very local soaring. 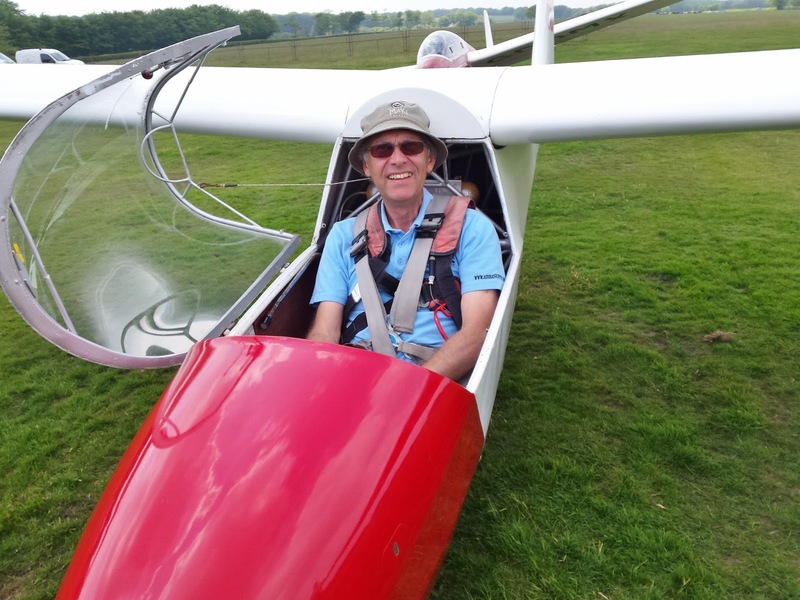 Best flight of the day was 46 minutes by Allan Holland in the K8. A nice club day among friends. 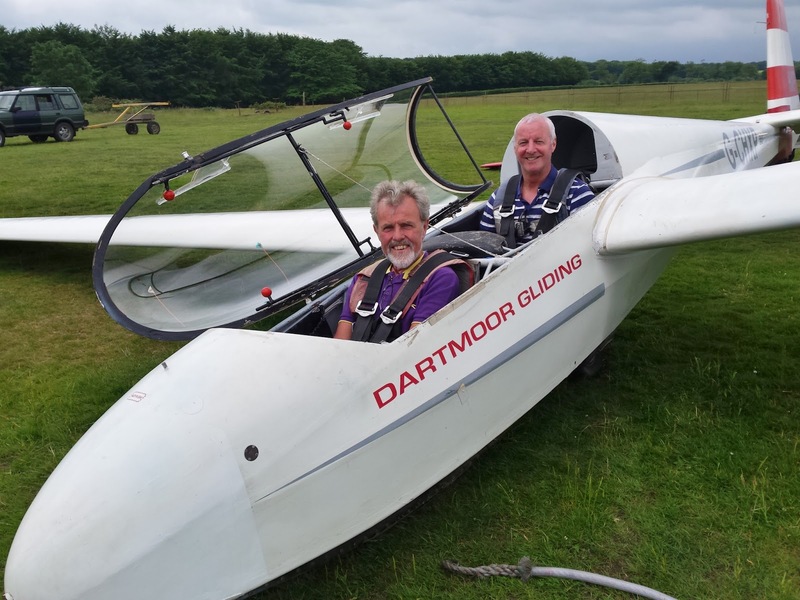 On Bank Holiday Monday Richard Roberts took to the sky in his K-6CR for a 113km triangle up to Crediton, down to Buckfastleigh and back. 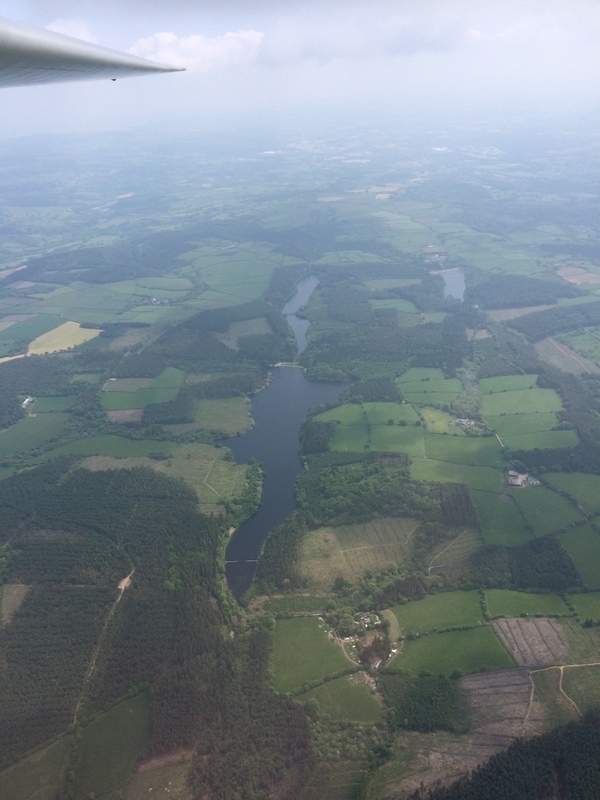 The photo here shows him passing Kennick Reservoir, north of Bovey Tracey, on the second leg. 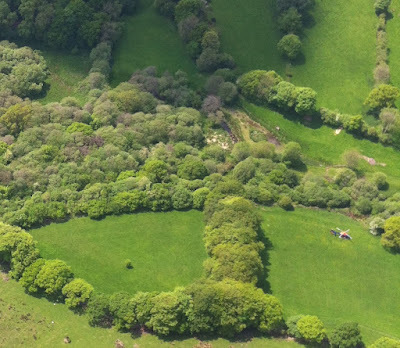 during the second leg (Crediton to Buckfasleigh) of his 113km task. Richard eventually landed at Langage Business Park (home of Langage Dairy Products) because, after 84kms on task “…it was so hot in the cockpit I needed an ice cream..!” Actually the weather deteriorated which lead to his landout and then recycled to become soarable again about which Richard said "Need to be more patient next time before pressing on". 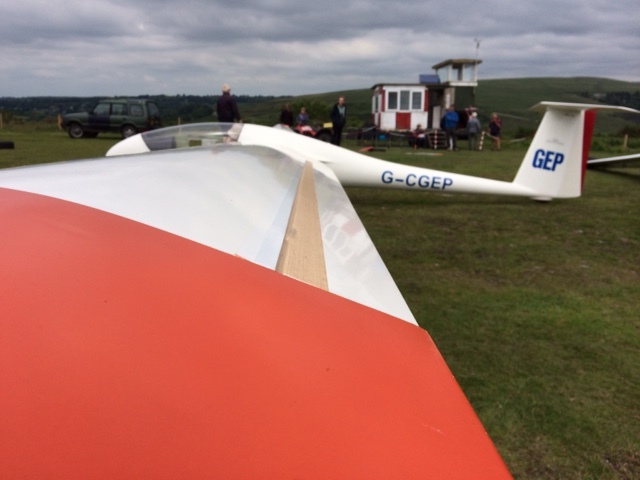 Richard's K6CR waiting for retrieve at Langage. 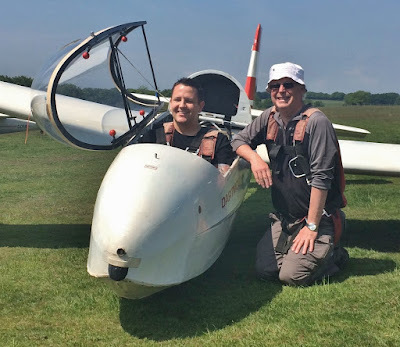 Richard wishes to send special thanks to Rick Wiles and Dave Bourchier for getting him airborne on what was otherwise a non flying day. 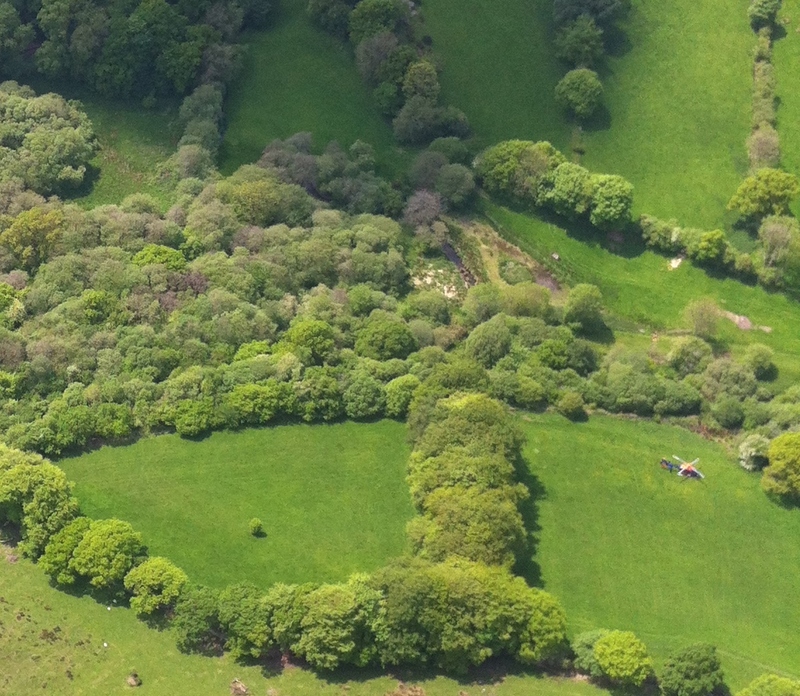 ‘parked’ in a field near North Brentor village all day. 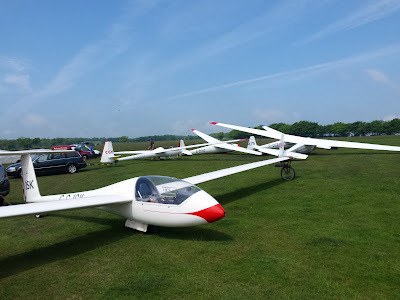 It was great to see so many people present today, and a great shame that a few trainees were not able to fly (due in part to the conditions described above, and also the congestion often caused by landings with no headwind component). The strong team on hand found plenty of use for their talents in welcoming our visitors, including One Day Course student Clive Hurford, Dan Ferguson (and three generations of his family, all of whom were impeccably behaved), Malcolm Hill, and that increasingly rare sighting the ‘walk in’ Geoff Orton, whose wife thought the weather might be just right today for the voucher she bought him for Christmas – too right it was! So spot the spelling mistake now. 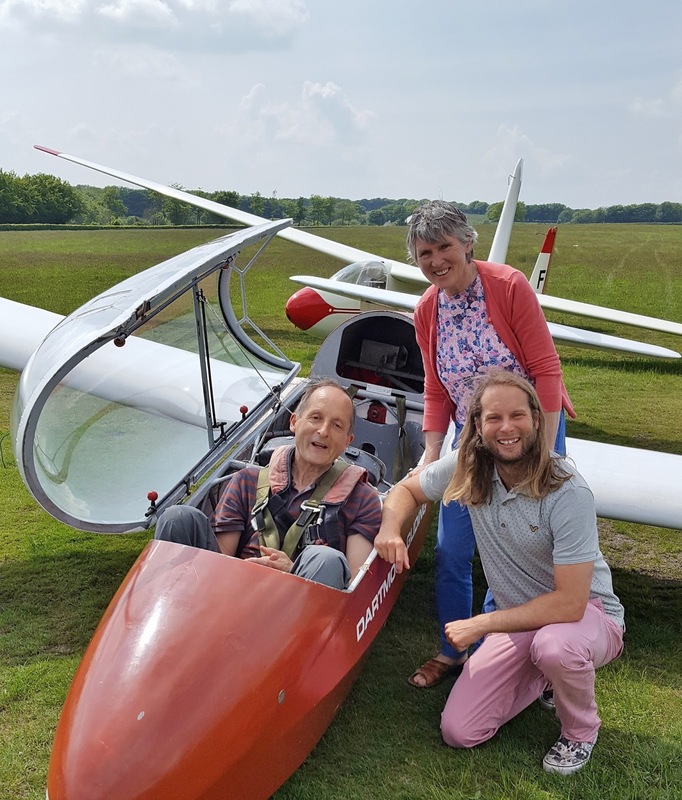 His flight was a ‘belated’ Christmas present..! The social - sorry solo – team were much taken up with the crosswind, and rightly so, given the expense of some of their toys and the fact that nature is no respecter of how easily damaged your flying machine may be - however once Roger Appleboom broke ranks in his K-6CR it did not take long for the others to follow suit, with Roger Green his ASW-20 (see photo), Leith Whittington in his Dart 17R and Pete Harvey flying his Std Cirrus from Brentor for the first time. Paula Howarth claimed flight of the day for club gliders with 19 mins in the K-8 (see photo), whilst Tony Dean also renewed his acquaintance with the old girl (the K-8 that is…). With Jayne Marsh and Dave Jones taking time out from their wedding preparations to train in the K-13, and Dave Downton and Jeff Cragg also flying duel (against the crosswind, not the instructor..! ), special mention must be made of Callum Doyle, who is our most recent Fixed Price to Solo signing. Callum, who is very aviation minded, works for Castle Air in Liskeard (the helicopter charter company) and will normally be flying with us on Fridays. 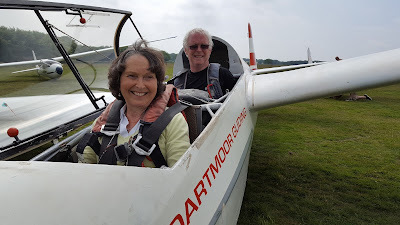 As the last flight touched down at 7:45pm, it wasn’t until about 8:15pm before we had shut the hangar doors and could think about making for home – nonetheless it had been worth it – or it certainly felt as if it had..! Today's weather played with our pilots hopes like a yo-yo. For a couple of days before there were posts on our club Forum suggesting that this could be the "Day of Days". Looking out of the window early on Saturday morning was enough to see those hopes dashed. Thick fog. The eternal optimism of the glider pilot allowed the thought that perhaps this is just sea mist to keep hopes alive. So, off inland towards the airfield soon this idea was soon dispelled. The airfield was shrouded in fog also. 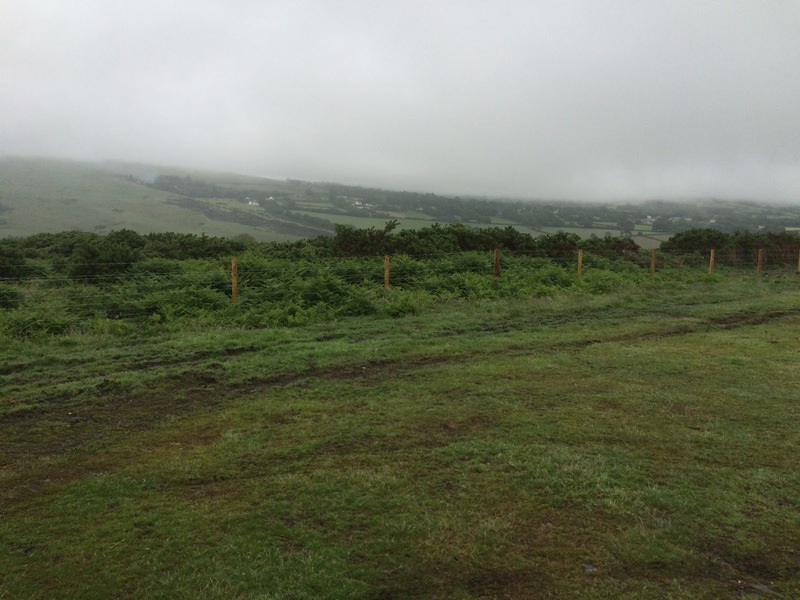 The early arrivals explained that the fog had arrived just as the airfield and all the kit was made ready. Nothing to do but wait. This gave us time to catch up with Mike Sloggett our lead instructor today who is always very welcome on the airfield. Mike has a long history with our club; his father was one of the founding members. 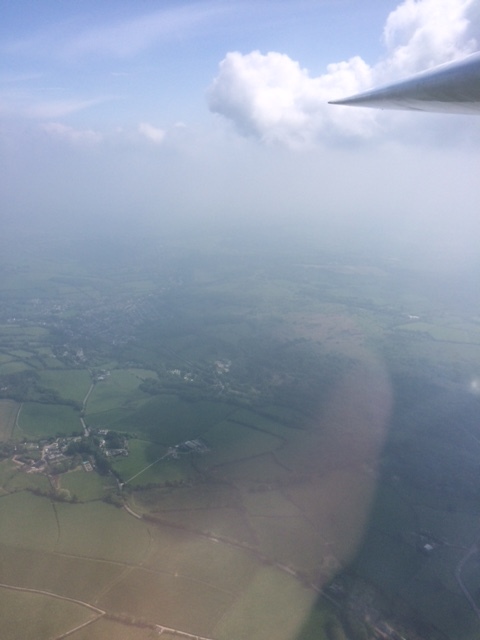 Around 11:30 the fog had lifted enough to commence flying operations. The launch point was busy with both training flying in the K13's and the single seaters who had turned up in hopes of a good day. A Gaggle of Gliders. Today's single seaters. Can we have them in a tidy line next time please? 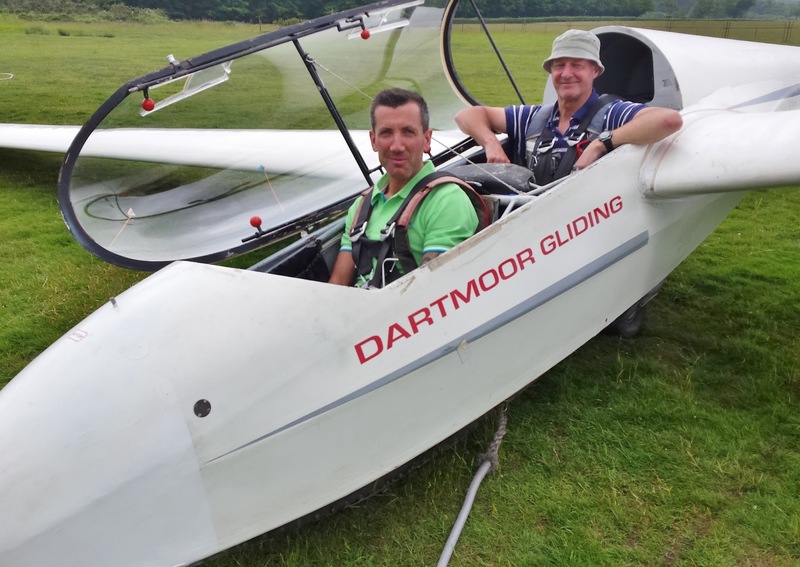 Visiblity was not great and the cloud base was low but this did not deter one of our cross country pilots, Mike Gadd, who disappeared into the gloom in his Open Cirrus determined to complete his planned flight Brentor - Holswothy - Crediton West - Brentor , a task of 107 km. 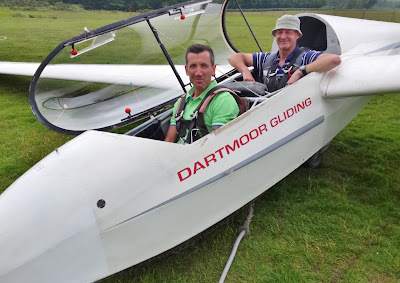 He said that Holsworthy was easy, Credition was difficult but the low cloud base delayed him so much that he just ran out of day and landed in a field on the way home after 82km. He was retrieved by Simon Collier in the early evening. We welcomed several visitors today. 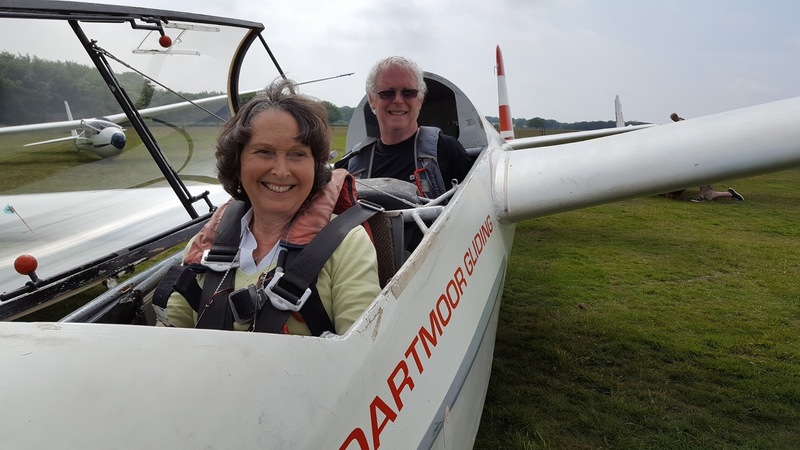 Sandra Corbett and Ray Cornwell enjoyed Introductory Flights with Rick Wiles. 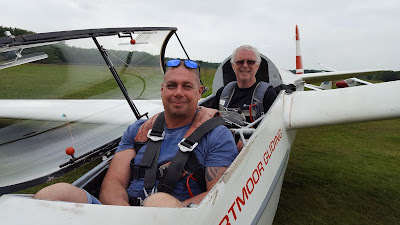 Peter Siddall was today's One Day Course student who enjoyed lots of soaring flights and, by the end of the day, was able to pilot the aircraft around the local area with some style. Apart from Mike's cross country, the best flight of the day was Richard Roberts who was airborne for 2 hours 36 minutes in the local area having abandoned his task because of the low cloud base. Another notable flight was by Stephen Fletcher who converted to the K8 with flights of 10 and 13 minutes. Well done Steve.